Hello again, fellow Cawder members. I just want to bring you up to date with some ideas and developments. The materials have arrived for the new shed, work is beginning as I write. Our new equipment will shortly have the housing maintenance facility badly needed. Praise is due to Neil and his staff for the fine progress with the 2nd and 17th projects on the Keir course. Great work! If you are interested on what work Neil and his team have been doing then please take a look at the Winter Programme Blog in the News Section of the website, and I am told that we should be back on the normal Cawder layout by the middle of March. Course-wise the die-back of vegetation has revealed a lot of litter on the courses. If we all picked up one piece each, the place would be cleared pretty swiftly. I entreat all members to take a pride in our courses. Similarly, the weather has allowed more play on the main greens, so the pitch-mark count is up. So please repair your pitchmarks, and repair them properly, as a badly repaired pitchmarks take twice as long to heal. Here is a good article on how to repair pitch marks correctly. The Biomass boiler has been playing up, causing heating problems. These are being tackled by engineers and the pellet suppliers. We expect a speedy resolution. It has come to my attention that there are a number of unpaid subscriptions/DD’s in 2017. The club has suffered a reduction in members over the winter, so the money is an important part of the monthly income, so please can you call the office to resolve the situation. That just leaves me to welcome Nick Gardner back of the club. Many will already know Nick, he re-joins us after after completing his first year of his PGA qualification at Kilmacolm GC. Great to have you back Nick. 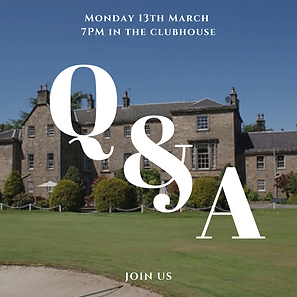 We would like to invite you to the first Q&A session of 2017 where we want to share with you our plans for the coming year, and give you a chance to provide feedback. This forum is of particular importance to us all, as we need your help and support on agreeing a member recruitment strategy for the coming season. So please come along and lend your support. The website has been given a face lift as you can see if your reading this 🙂 and the 2017 fixtures and Events diary have been updated, so thanks to Andy Fairbairn for the hard work. Martin Lunn has joined the committee and with his digital background he and Andy plan to the move the website onto a new platform with new plugins as well as making it to be easier to maintain and keep up-to-date. So look out for further updates. The committee positions are filling up now, so please welcome my new vice captain Jim Mearns, along with Neal Caraher, Andy Fairbairn and Martin Lunn to the committee. We are still looking for a Match and Handicap convenor and at the members forum we would like to recruit members for the 2017 sub-committees, so please join us and help support your club. Its brilliant to see the social committee forging ahead. Particular thanks to Harry Clark and Frances McCall for input there. It has been suggested that members partners should subscribe to the newsletter so they too see information on forthcoming events. So if they are interested then please ask them to subscribe. Valentines night was a great success. We sold all of the tickets and the feedback has been fantastic. So thanks to all that came along and supported the event. I am told there are photos on Facebook so if you haven’t seen them already then please take a look. 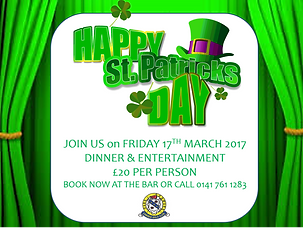 The next night planned is for St Patrick’s Day, so we hope to see as many as possible. I may be up Irish dancing…….. that’s got to be worth the ticket price?